Have some frozen meatballs and marinara? Here is a quick (and very filling) snack or lunch whose components you can keep on hand in your freezer. I was lucky enough to find these little football shaped rolls at the store selling for $2.50 for a pack of ten. On first glance the rolls look small but really, who needs a 12 inch sub? 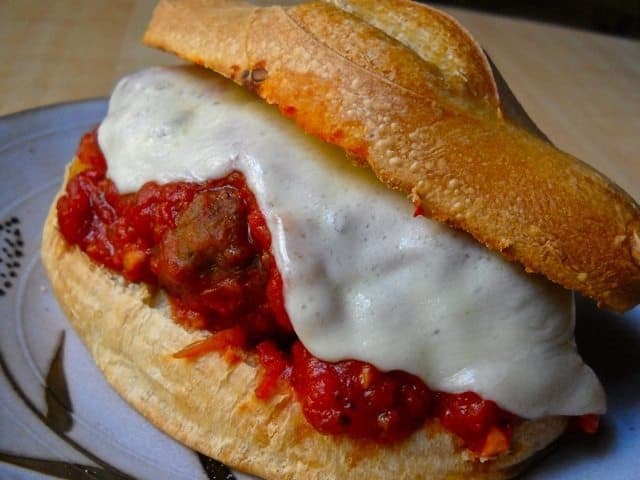 Especially when it has four of these super hearty meatballs on it. Although this sandwich is smaller than something you might get at a local sub shop (it’s about the size of my outstretched hand), it is every bit as satisfying and filling! 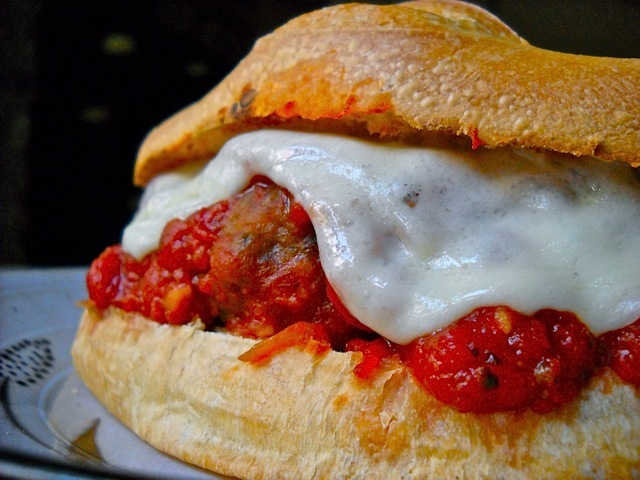 When you make a big batch of homemade meatballs, be sure to reserve a few for this American classic! Preheat the oven on the broiler setting at 400 degrees. In a microwave safe dish heat the meatballs and marinara sauce. Slice your roll lengthwise. Spoon on the meatballs and cover with any remaining marinara sauce. Arrange the sliced cheese on top (I cut my piece in half to make it cover a longer/narrower surface area… kinda like the cheese “triangles” at sub shops). Place the sandwich, open faced, on a cookie sheet and place under the broiler (make sure the rack is positioned so there is a few inches between the top of the sandwich and the heating element). Broil until the cheese is melted and the edges of the roll is brown and crispy. DIG IN! … make sure you have some napkins! NOTE: When I made the meatballs, I packed most of them into freezer bags in groups of 8. I also froze some of the sauce and when I bought the rolls, I put them straight into the freezer. Now, all I have to do is pull out some meatballs, marinara, a roll, heat ’em all up and enjoy. The bread thaws really fast and it’s ready slice within a few minutes out of the freezer. Since it’s going under the broiler you don’t even have to wait for it to thaw all the way before building the sandwich! Made these tonight (with the meatballs and sauce from Trader Joes bcuz I didn’t have any of the homemade) and they are delicious!! Thanks for yet another yummy meal to add into the rotation!! my husband is going to love this recipe! thanks for sharing!